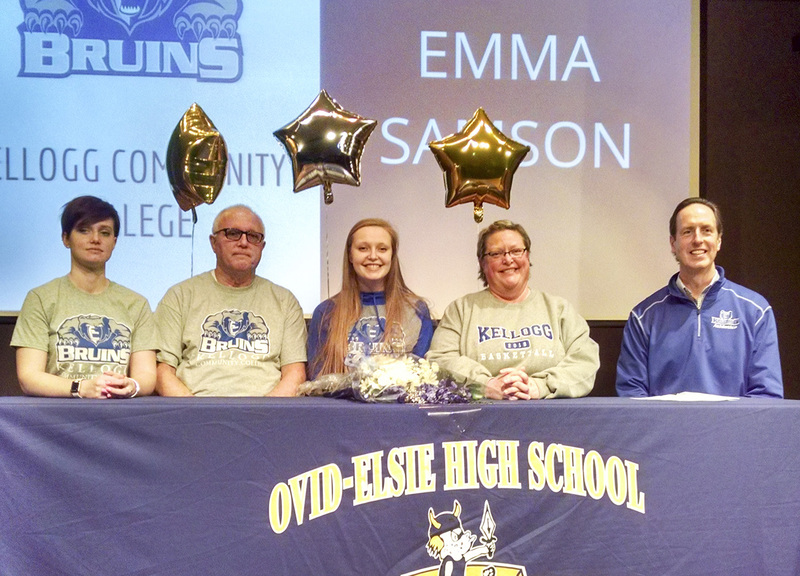 Emma Samson, of Elsie, has signed a National Letter of Intent to play women’s basketball at Kellogg Community College and will begin playing for the Bruins next season. Samson, a senior at Ovid-Elsie High School, was captain of her high school basketball team and earned high school basketball honors including Most Valuable Player and Honorable Mention All-Conference. She also earned several awards as a player and captain on her high school tennis and volleyball teams. A Top 10 Division II equestrian rider, Samson is a member of the Future Farmers of America and also participates in 4-H.
“I’m really looking forward to having Emma be part of what we’re building here at KCC and helping us put Lady Bruin basketball on top,” Dic Doumanian, head coach of KCC’s women’s basketball team, said. KCC’s women’s basketball team finished the 2017-18 season late last month. It was the first season in nearly a decade under new Head Coach Doumanian, who led the Bruins for seven seasons from 2000-01 to 2006-07. For more information about women’s basketball at KCC, visit www.kellogg.edu/womens-basketball or contact Coach Doumanian at doumaniand@kellogg.edu. Pictured in the above photo, from left to right, are Grace Samson (sister), Robert Samson (father), Emma Samson, Beverly Samson (mother) and KCC’s Head Women’s Basketball Coach Dic Doumanian.